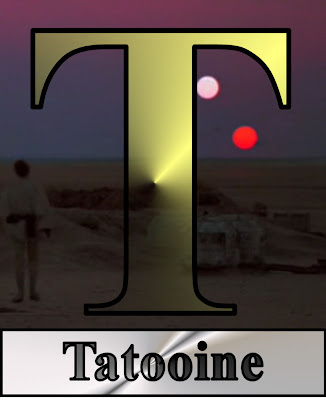 "T" is for Tuesday...and Tatooine. Ah, Tatooine, the Cradle of Skywalkers. We were introduced to this pathetic "go nowhere" planet in the first Star Wars movie when a fateful battle erupted between a Rebel blockade runner and a Star Destroyer. An escape pod carrying two certain droids crash-landed on Tatooine...which is kind of your small-town, no future, single traffic light town. Luke Skywalker implies nothing exciting ever happens on Tatooine. Obviously, Luke's Uncle Owen never let him march down to the Tatooine Historical Society. So...um...yeah. Tatooine is kind of like the small-town high school that annually produces top-flight athletes, yet somehow manages to retain a certain, dismissive anonymity. And did you see this? Tatooine exists in real life! TOMORROW: Short and ugly, they may have been what Kramer actually spotted in an episode of "Seinfeld."